Police tape marks off a neighborhood in Austin, Texas, where a package bomb went off Sunday night, injuring two people. More than 500 investigators and bomb techs have streamed into Austin, Texas, to look for clues and to catch what they're now calling a "serial bomber." Five explosions have killed two people and injured several more, one gravely. In the latest attack, a package bound for Austin exploded at a FedEx distribution facility. Before that, two men in their early 20s were walking along a quiet street Sunday night when they tripped a wire that exploded a bomb near a hiking trail, authorities said. They remain hospitalized in stable condition. The blasts, which have occurred over less than three weeks, have unnerved the Lone Star State's capital. According to FBI Special Agent in Charge Christopher Combs, it raised alarms for authorities. "It changes it from a more targeted approach to a more random approach," he told reporters, "and that's very concerning to us." Officials say the bomber has shown a particular sophistication with triggers. The first two bombs blew up when victims picked up packages left at doorsteps. The third exploded when the person took the box indoors and opened it. The fourth went off when the two pedestrians hit a thin metal wire or fishing line. The fifth exploded at a package distribution facility. Yet the bomber has defied a discernible pattern of attack. The victims we know of so far have been racially diverse — black, Hispanic and white. The FBI's renowned behavioral profilers are now in Austin, and Combs says they are anxious to know whom they're dealing with. "We would like the bomber to reach out to us so we can talk to them. So we can understand why are they doing this," he says. "Is it terrorism? Is it civil rights? Is it something completely off the radar? We don't know that. And that's why it's important to get this dialogue going." Austin Police say they have persons of interest, but no suspects. Consultant Anthony May spent 20 years as a bomb tech in the military and 20 more years as a bomb specialist with the Bureau of Alcohol, Tobacco, Firearms and Explosives. "When the device goes off," he says, "that doesn't mean the evidence goes away. The criminal investigators, the FBI, the ATF, they are probably collecting 98 to 99 percent of the material used in that particular bomb." May says they look for the device's unique "signature" and then start visiting stores to find out who made multiple purchases of these items. An ATF source, who asked not to be named because he wasn't authorized to speak, says they're also looking at recent police reports of explosions — perhaps in rural areas near Austin — where the bomber may have tested a mechanism. Public officials are telling folks what has become a familiar watchword — see something, say something. It could be a backpack, a suitcase, a bag, a box — anything that looks suspicious or out of place. James Flowers, CEO of Driftwood Recovery just west of Austin, says he called a local fire department when a box from Amazon showed up at his office door that was strangely taped. "They (the firemen) said, 'Walk away. Don't touch it.' A fire engine pulled up 10 minutes later," Flowers said. The package turned out to contain floor cleaner, vacuum bags and books — exactly what he had ordered. On Monday, Natalie Janis called the hospital where she's a nurse and said she was scared to come into work for her early morning shift. She says she went to a park with her daughter because she feels safe there. "We're afraid," she says. "We're afraid to leave. I feel safe in the park because I can see everyone who's around me. But they're putting bombs everywhere." "I'm on alert for whatever type of situation," she adds. "I'm ready to call 911." 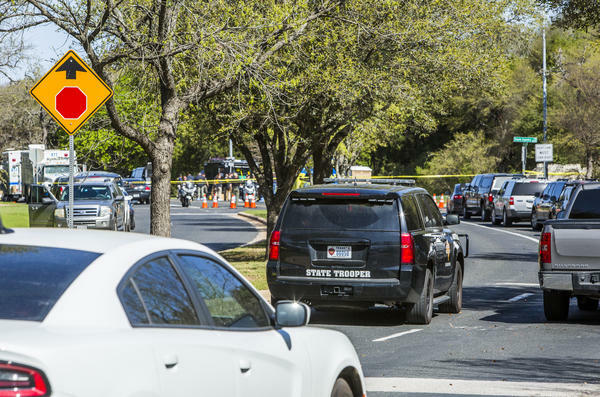 Investigators are combing a neighborhood in Austin, Texas, looking for clues to catch what they're now calling a serial bomber. Since the beginning of this month, four explosions across the city have killed two people and wounded four others, one gravely. Here's NPR's John Burnett. JOHN BURNETT, BYLINE: Bomb experts from around the nation are streaming into the capital of Texas, hoping to solve this macabre mystery before the bomber strikes again. In the latest attack, two men in their early 20s were walking along a quiet street Sunday night when they tripped a wire that exploded a bomb near a hiking trail. They remain hospitalized in stable condition. The fourth bombing in 16 days has deeply unnerved this friendly, funky, Sunbelt city. And according to Chris Combs, FBI special agent in charge, it was a game changer. CHRIS COMBS: It changes it from a more of a targeted approach to a more random approach, and that's very concerning to us. BURNETT: Officials say the bomber knows what he's doing. He's shown a sophistication with triggers. Two bombs blew up when the victims picked up packages left at doorsteps. The third exploded when the person took the box indoors and opened it. The fourth went off when the two pedestrians hit a thin metal wire or fishing line that triggered a bomb. And yet the bomber has defied a discernible pattern of attack. His four strikes have been geographically and racially diverse - black, Latino and white. The FBI's renowned behavioral profilers are now in Austin, and Combs says they're anxious to know who they're dealing with. COMBS: We would like the bomber to reach out to us so we can talk to them, so that we can understand why are they doing this. Is it terrorism? Is it civil rights? Is it something completely off the radar? We don't know that, and that's why it's important to get this dialogue going. BURNETT: More than 500 investigators and bomb technicians are on the case. Austin police say they have persons of interest but no suspects. Anthony May spent 20 years as a bomb tech in the military and 20 more years as a bomb specialist with Alcohol, Tobacco, Firearms and Explosives. Now he's a consultant in Arizona. ANTHONY MAY: When the device goes off, that doesn't mean the evidence goes away. The criminal investigators, the FBI, the ATF, they are probably collecting 98 to 99 percent of the material used in that particular bomb. BURNETT: May says they look for the device's unique signature then start visiting stores to find out who made multiple purchases of these items. An ATF source who asked not to be named because he wasn't authorized to speak says they're also looking at recent police reports of explosions, perhaps in rural areas near Austin, where the bomber may have tested his mechanism. Public officials are telling folks what has become the grim watchword of our times, See Something, Say Something - a backpack, a suitcase, a bag, a box, anything that looks suspicious or out of place. One CEO told me he called a local fire department when a box from Amazon showed up at his office door that was strangely taped. Tense moments ensued. The package turned out to contain floor cleaner, vacuum bags and books, just what he'd ordered. On Monday morning, Natalie Janis (ph) called the hospital where she's a nurse and said she was scared to come into work for her early morning shift. I found her at Zilker Park at noon playing with her daughter, Sofia (ph). Janis is from Reynosa, Mexico. BURNETT: "We're afraid. We're afraid to leave. I feel safe in the park because I can see everyone who's around me," she says. "But they're putting bombs everywhere. I'm on alert for whatever type of situation. I'm ready to call 911." John Burnett, NPR News, Austin. Transcript provided by NPR, Copyright NPR.